Ivanka Trump's fashion brand sought to distance itself from a Chinese manufacturer that has come under scrutiny after activists investigating labor conditions there were detained, saying the company last made its products three months ago. In a statement released Wednesday, the brand's president, Abigail Klem, said Ivanka Trump shoes, which are made by licensing partner Mark Fisher, have not been produced since March at the Huajian Group factory where alleged labor abuses occurred. She added "our licensee works with many footwear production factories and all factories are required to operate within strict social compliance regulations." But it is unclear whether that was really the end of the relationship. China Labor Watch, a New York nonprofit, began scrutinizing Ivanka Trump supply chains more than a year ago, according to Li Qiang, the group's executive director. Three China Labor Watch investigators went into Huajian Group factories undercover posing as workers in March, April and May of this year and found Ivanka Trump merchandise inside, Li said. 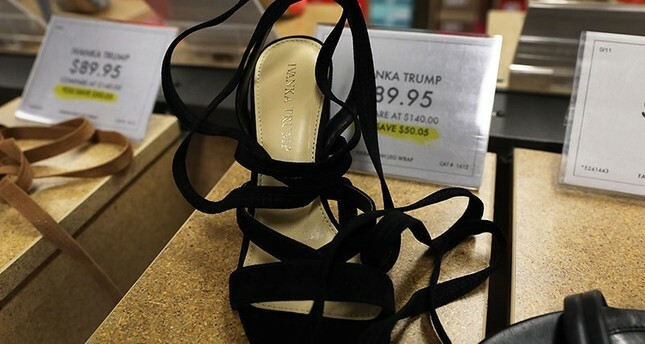 He said the investigators also found evidence of planned production, namely an April production schedule indicating pending orders for nearly 1,000 pairs of Ivanka Trump shoes due by the end of last month. Now all three men are in jail, accused of using illegal recording devices to disrupt Huajian's business. The U.S. State Department and Amnesty International have spoken out against the arrests. So far, Ivanka Trump and her brand have not. China Labor Watch laid out its initial allegations in an April letter to Ivanka Trump. It said workers regularly put in more than 15 hours a day, with just two days off a month. It said most were paid by the piece, taking home just $363 a month for 300 hours of work, and that managers verbally abuse workers. "China Labor Watch expects you, as an assistant to the president and an advocate for women's rights, to urge your brand's supplier factories to improve their conditions," Li wrote in the letter. "Your words and deeds can make a difference in these factory workers' lives." The Huajian Group says the undercover activists were out to steal trade secrets and denies the allegations of poor working conditions. Some argue that the arrest of independent monitors threatens to hamper the ability of global companies to adequately monitor their Chinese suppliers. China has rebuffed the State Department's request to release the activists, saying the men will be dealt with under China's own sovereign laws. China has swept up hundreds of human rights lawyers and labor activists in recent years and begun to scrutinize groups with foreign ties, like China Labor Watch, much more closely. Alicia Edwards, a State Department spokeswoman, said this week that the U.S. is concerned by "the pattern of arrests and detentions." Labor activists, she added, are instrumental in helping American companies understand conditions in their supply chains and holding Chinese manufacturers accountable under Chinese law.